If your Mom or Dad is getting confused easily or is a potential episode of Hoarders on A&E, it’s time to intervene and make their life less stress, and consequently yours. Plus, medication errors are no joke, including not taking medication because you can’t find it or taking the wrong medication. Let’s get started by organizing the medicine cabinet. Discard all old or unused prescriptions, over-the-counter drugs, ointments and medicated creams. If there’s no expiration date, take a look at the condition of the container. If it looks old or damaged, chuck it. New Habit: With new prescriptions or over-the-counter medications without expiration dates, mark the date of purchase on the containers and throw them out after a year. New Habit: Stay on top of expiration dates and make sure you have more medicine on the way before you run out of one that’s necessary daily. Another thing to consider, take things out of the medicine cabinet that deserve a more logical home, such as shampoo, shaving cream, make-up and toothpaste. These items can be stored in under-sink baskets, in vanity drawers or shelves to free up valuable space in the medicine cabinet. New Habit: The medicine cabinet is now only for health-care and first-aid essentials, that should be restocked regularly. Most medicine cabinets also have limited space between shelves, making it difficult to store large bottles of antiseptics and other medicine. New Habit: keep limited amounts of these items in labeled, refillable smaller bottles. If your Mom or Dad takes a lot of medication daily, create a medication dosage schedule chart. The chart should include all medications, the times they need to be taken, and a space by each dose, so you can check off when each is taken. For those meds that are given “as needed,” you may also want to include why it is taken (“for nausea” or for whatever reason). 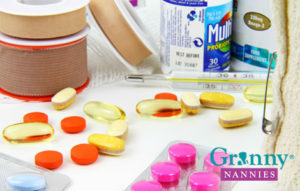 If you have medications that require refrigeration, also note it. Bring this list to doctors’ appointments and to the pharmacist. Keep a copy stored on your smartphone or computer, so you can update it accordingly. For some people, using a smartphone or tablet and an app to manage medications is better than a paper list. There are apps that allow you to tailor your medication schedule and will send you reminders to take your pills.